With spring in the air, there’s a good chance that you’re already working on getting the interior of your home all cleaned out. However, if you haven’t cleaned the outside part of your home, there’s no time like the present. Below are some helpful hints for scrubbing your home exterior and making things look like new. The most common way to remove dirt, mildew, and other debris from a home exterior is with a pressure washer, but you should be very careful with this – or perhaps even hire a professional. Pressure washers are great for brick and similar materials, but a high-pressure flow can puncture vinyl or wood and cause more issues than when you started. Rather than using high pressure, consider using a detergent and a lower-pressure spray to get the job done. If there is mildew or mold present, be sure to use a solution that includes bleach and allow it to sit for 15 minutes before rinsing it away. This will kill any spores and prevent the mold or mildew from returning. Next, you may find that you need to clean and repair your driveway. A pressure washer is fantastic for removing oil and other debris from driveways, and once that task is finished, you can repair cracks and other problems. If you have cracks, remove grass or weeds that you see growing through them and then use a pressure washer to remove the dirt and grime left over. Use a concrete resurfacer to fix any holes or cracks if your driveway is made of concrete; if it is asphalt, use a quality latex asphalt sealer, instead. A wood deck is a favorite among homeowners in the DC area. It provides an excellent place to relax outdoors and barbeque, enjoy a cold drink, or just enjoy the sun. 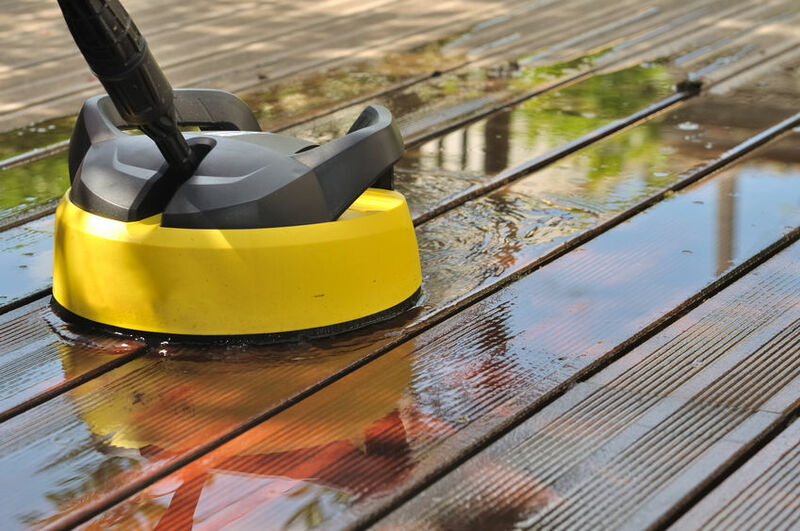 Unfortunately, the sun, wind, and rain can take a toll on your deck, but there are things you can do to clean it up and make it look like new. Use a sprayer to apply a deck cleaner to the wood, and then spray it off with a pressure washer once the cleaner has had time to sit. Rinse the deck thoroughly and allow it to dry before refinishing with stain or sealant if necessary. If your gutters are in need of a good cleaning and you feel comfortable on your roof or on a ladder, then you can do this task yourself, but you can also call a professional if need be. Cleaning your gutters involves removing leaves, twigs, and other debris by scooping them out and into a bag or tarp. As you go, keep an eye out for problems, such as cracks in the system or areas where the gutters have begun to pull away from your home. Run water through the downspouts to check for leaks and use gutter sealant to fix any holes or leaks at joints that you might find. Cleaning the outside of your home is just as important as cleaning the inside, and that’s especially true if you enjoy springtime get-togethers and barbeques. These tips are sure to help you get the most out of your exterior spring cleaning, but never hesitate to call a professional for assistance with anything on this list.